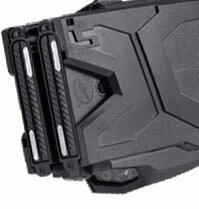 TASER X2 Defender cartridges weigh 2.4 ounces, are 2.1 inches in length, 1.9 inches in height and 1.4 inches wide. The TASER X2 offers two shot capability without having to reload between shots. TASER X2 Defender cartridges only fit the TASER X2. They will not fit any other TASER models.